Norther marks the 4th project of MHI Vestas in Belgium, but it's the first time, a V164-8.4 MW is installed in the country. It's a huge step forward for offshore wind efficiency in the market compared to previous 3.3 MW installations. 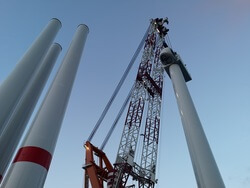 Another milestone is also coming up, when additionally, the V164 platform is nearing the mark of 200 installed turbines in the coming days.